Following collaboration between Our Lady Star of The Sea Catholic Church, New Road, Porthcawl and the Porthcawl Community First Responders another 24/7 Public Access Defibrillator has 'gone live' for members of the community to use in a medical emergency where someone is suffering from a Cardiac Arrest. I huge thanks to Chris Bale from the church and Porthcawl CFR's own Rhys Morgan for working to get this off the ground. Also a massive thanks to Dave from Connections Electrical Services for fitting the heated cabinet for us. Hopefully several more such installations to follow in Porthcawl over the coming months. A huge "well done" to all at the Seagull Pub in Nottage who held a very successful Coffee Morning in aid of their campaign to purchase and install a Public Access Defibrillator (PAD) on the outside of the Pub. The response from the local community was superb and it was a pleasure for our team to play a small part in the event. Hopefully their target will be met very soon and a PAD installed for the benefit of the local community, further updates on this fabulous initiative will be posted when they are received. 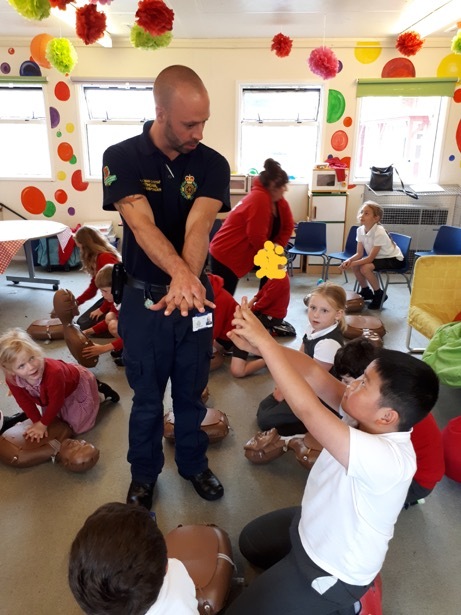 What a cracking evening we had when we visited the 4th Porthcawl Brownies at Nottage to talk about Basic Life Support and to give the Brownies an opportunity to 'have a go' at CPR on training dolls. We had a tremendous welcome and the 12 Brownies were very attentive and all of them got involved to make it a very successful evening. Thanks to all the 4th Porthcawl Brownies and their Leaders for the invite. 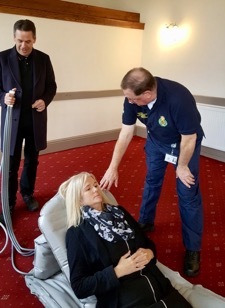 A huge THANK YOU to Bridgend County Borough Councillor Sean Apsey (Porthcawl West Central) who has used part of his Community Action Fund to purchase a Camel Lifting Device for the Porthcawl Community First Responders. 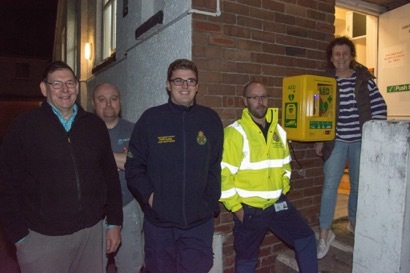 On Saturday 13th October 2018 Councillor Aspey, accompanied by Porthcawl Town Councillor Tracy Hill, handed over the equipment and within an hour it was 'on call' with the Porthcawl CFR Team (981C) covering the Porthcawl area, but not before he took the opportunity to try it out. A massive THANK YOU to the organising committee of the Newton Fest '18 for the extremely generous donation following this years successful event. 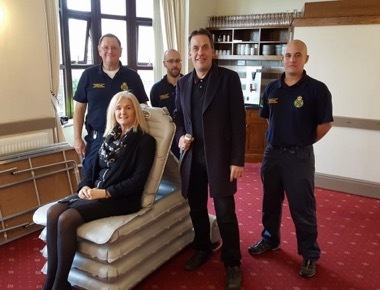 We are very grateful - the monies will be put to good use in assisting us to but the essential equipment needed to respond to medical emergencies on behalf of the Welsh Ambulance Service in and around the Porthcawl area. 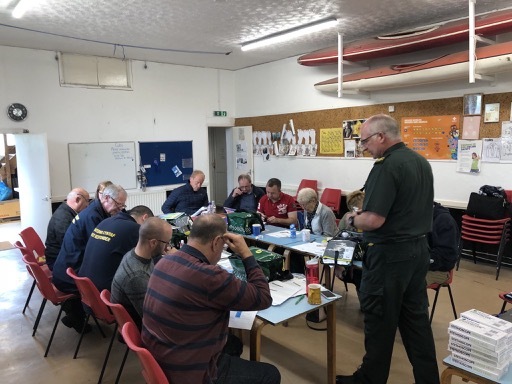 Over the weekend of the 15th and 16th September 2018 members of the Porthcawl CFR team joined other teams from around the region in training for the 'Enhanced CFR Feasibility programme'. For the next six months or so trained CFR's will be able to take additional patient observations (including temperature, blood pressure, blood oxygen levels and blood sugar levels) that will hopefully increase the value CFR teams will bring when attending calls in support of the Welsh Ambulance Service and improve the quality and level of information being passed back to the Critical Desk. 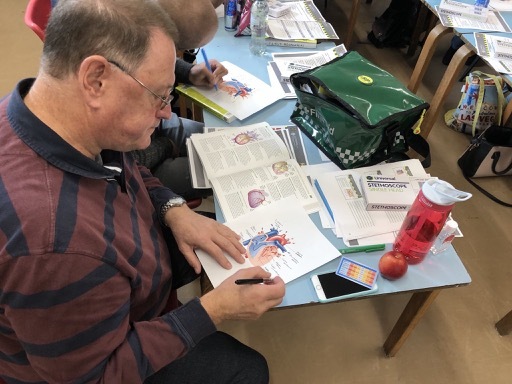 It is anticipated that these additional skills will enable CFR's to carry out a more comprehensive and complete patient assessment thereby increasing the quality of patient care and information passed onto Ambulance staff during the Patient Handover Process. 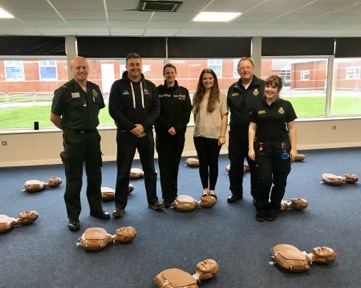 In early September 2018 Porthcawl CFR Rhys Morgan started a two-year Paramedic Science Course at Swansea University which, after successful completion, will see him become a qualified Paramedic. Rhys since he joined the team back in October 2017 and it has been a pleasure to watch him develop and grow into a first-rate CFR, his dedication to the team and enthusiasm cannot be faulted. Our WAST Liaison Officer has a quotation that he puts at the end of emails - “the heart of a volunteer is not measured in size, but by the depth of the commitment to make a difference in the lives of others”, Rhys has certainly taking this onboard in his time with us. On the 6th August 2018 the first of hopefully many PADs (Public Access Defibrillators) went live in Porthcawl. 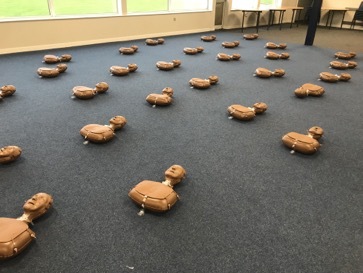 It is located on the Porthcawl Ambulance Station and is intended for use by members of the public in the case of a sudden cardiac arrest. It was funded by donations to the Porthcawl Community First Responders by local people and organisations. We as a team are committed to adding more PADs around the town but at over a £1000 per location it will take time and money, but we are determined to get as many PADs as possible in and around Porthcawl as possible. Below the team and CTL Huw Jackson (Welsh Ambulance Service) formally launch the PAD. A huge "THANK YOU" to the Porthcawl Town Council for the grant to the Porthcawl Community First Responders. 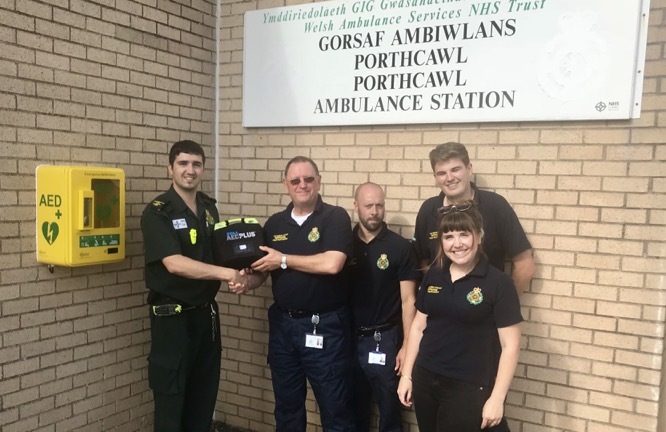 The grant has enabled us to buy a defibrillator that is already being used by the team when on call for the Welsh Ambulance Service responding to emergency 999 calls in Porthcawl and its surrounding area. 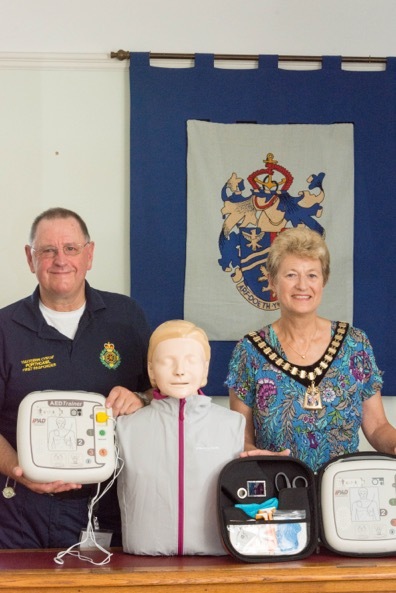 In addition, the grant has enabled us to buy a training defibrillator and CPR training doll - these will be used to maintain the team's skills and also allow us to start training members of the public within the Porthcawl community. 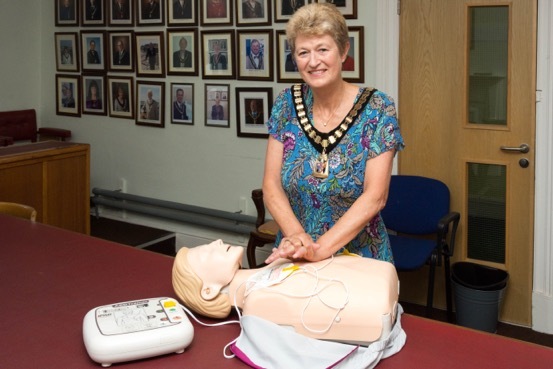 The equipment was formally handed over by the Porthcawl Town Council Mayor, Councillor Norah Clark at the Council Chambers on Tuesday 3rd July 2018. 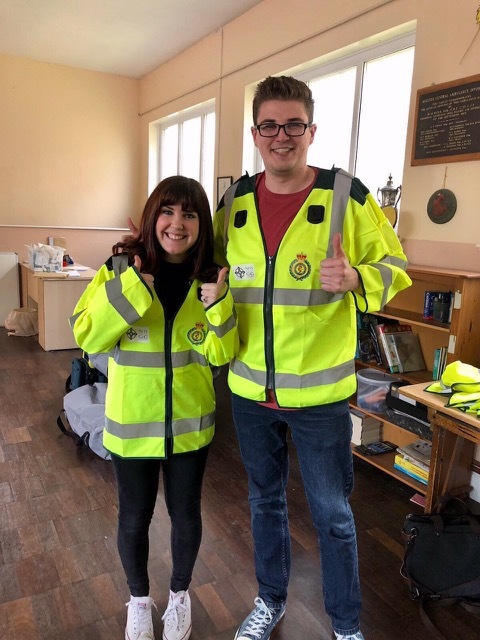 In past few weeks we have been fortunate to have two new members join our team following their successful training by the Welsh Ambulance Service. Welcome to Celyn and Daniel.